A group of Istanbul children are about to graduate from a special course teaching computer software-writing, as part of a new project to build digital skills in Turkey. More than 3,000 children, aged between 7 and 12, participated in the project: the first group of students will graduate in June. Istanbul's Metropolitan Municipality is conducting a pilot project, based on the notion that digital thinking skills are becoming ever more important in daily life. "We are surrounded by electronic devices controlled by computers and each computer has been encoded," Anadolu Agency was told by Samed Ağırbaş, the municipality's youth deputy and the manager of the project titled "Coding Istanbul." Ağırbaş said that the project did not directly aim to train the software professionals of the future, but to give children an appreciation of what can be created with technology. "Although every mobile application, game, website, and piece of software is created with code, we usually know nothing about how to code even a simple program," Ağırbaş added. Coding - or computer programing - is writing the software which tells a computer what to do, using a software language which encodes instructions which the computer follows. Even though some anti-addiction non-govermental organizations argue that children are spending too much time on their computers, the municipality said it wanted to channel children's interests in the right directions. This is the first time in Turkey that any public body has run a coding course for primary schoolchildren. The manager said: "This can be considered a considerable step for the country." A recent report showed that 14 European countries now include coding in their school curriculum. 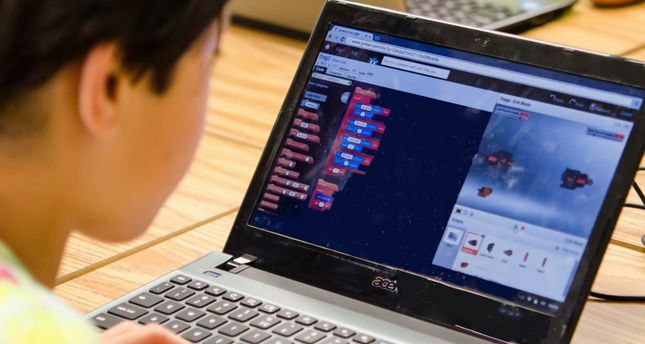 Finland announced that it would integrate coding lessons into the curriculum this year. The members of the municipality's youth council, which consists of university and high school students, started the project as a "youth-led movement" in December 2015. The project includes four full days of training in how to write code, plus two full-day visits to municipal software units such as the traffic control center of the city - making three weekends in total. Over 15 computer and software engineers teach voluntarily in the municipality's two training centers located in Taksim and Fatih, on Istanbul's European side. The municipality created a special bus - designed as a computer classroom - to increase access for disadvantaged children living in Istanbul's rural areas, as "this is also a social inclusion project," Ağırbaş added. After the three weeks of the program, the children are expected to continue learning online, with trainers periodically following their improvement. Ağırbaş acknowledged that the length of the course could be considered too short. "However, communicating an understanding of how to express ideas that a computer can enact accurately is more important than teaching the details of the coding language." Code.org, a U.S.-based non-profit organization that aims to encourage school students to learn computer science, says that learning to code develops skills such as problem-solving and creativity. The European Union estimated last week that there could be up to 825,000 unfilled vacancies for ICT (information and communications technology) professionals by 2020. The European Union's multi-stakeholder partnership initiative, the Grand Coalition for Digital Jobs, also claimed that in the near future, 90 percent of jobs would require some level of digital skills. The 28-country bloc encourages member states to run coding lessons for pupils. Ağırbaş stated that there was a plan for the coding project to be expanded to all provinces of the country through the Turkish Association of Municipalities. The Istanbul Metropolitan Municipality hopes to reach at least 40,000 children by next September.